One thing I utterly despise is the incessant need of music lovers to try and categorize all different types of music. And while for some bands it's quite easy to identify them as metal, alternative or pop, others blur the lines between these. These such band often fall under the title of 'progressive' for taking a new approach. However, if a band is truly progressive then trying to contain them into one single category is not only impossible but also stupid. This is true of Muse. Combining influences as far reaching as brit pop to electronica to metal, Muse is a band all its own. That being said, The Resistance is Muse's hope to continue the huge success and popularity of Black Holes and Revelations. And that's precisely what it does. The Resistance trumps everything the former attempted by leaps and bounds. 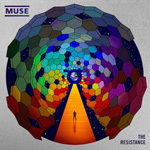 'Resistance' is a form of 'Soldier's Poem' on steroids, 'I Belong to You' offers more chills than 'Take a Bow' ever could, 'Guiding Light' has a guitar solo that melts more faces than the on in 'Invincible', and even the epic 'Knights of Cydonia' is topped by the three part 'Exogenesis: Symphony'. When you break the record down, you'll find Muse has a decidedly more pop presence. 'Uprising' keeps a beat that encourages if not demands dancing and 'Undisclosed Desires' is almost a by the book pop song amped to the fullest degree. Rock is still present on the album, just buried a bit deeper. The beginning of 'Unnatural Selection' is probably the closest thing we'll ever come to progressive surf rock and 'MK Ultra' rocks with the best bands out there. Normally I would point out the standouts on the album now but this time all I have to do is point the entire album. Not a single track disappoints. In fact they're all simply astounding. A modern album that takes the listener for a ride such as this simply cannot be criticized. I believe it's against the law. The Resistance simply must be experienced. The fact that Muse improved upon the masterpiece that was Black Holes and Revelations is simply astounding. This is truly Muse's magnum opus. At least until their next album.